Are those golden eyes wearing rose tinted specs? Highly revered by countless N64 owners, GoldenEye 007 is often credited with kick-starting the first-person shooter craze on consoles. It not only showed that a good FPS could be crafted for a machine other than a high-spec PC, but arguably also created the multiplayer FPS phenomenon. In fact, if it weren't for GoldenEye, it's quite feasible that a franchise such as Call of Duty might never have experienced the ridiculous popularity it's grown accustomed to in the last few years. However, the games industry evolves and moves along faster than that of perhaps any other entertainment medium and gamers, likewise, are more often than not a fickle bunch. Aside from certain titles that manage to cling onto what we like to refer to as "retro charm", a game that would have been cutting-edge in 1997 might not necessarily cut the mustard when placed side-by-side with today's games. So should you still bother with GoldenEye? Visually, Rare's magnum opus of the 20th century is difficult to pigeon-hole, perched precariously between so-bad-it's-good and simply past-its-prime. Naturally its production values don't have a hope in Hell of impressing in this day and age: blurry textures, characters with permanently clenched cube-shaped fists and the lack of any speech — save for the odd grunt or groan — may have impressed in 1997, but their limitations are all too clear today. GoldenEye, luckily, has more to offer than flashy graphics and Hollywood flair. The FPS genre has had many years to degrade into a series of linear shooting galleries in which players are spoon-fed objectives that are never off the beaten track anyway, so playing GoldenEye will be quite a shock to many younger gamers. Rare constructed a brilliantly balanced difficulty system that not only affected the amount of damage that the player and the AI enemies inflict, but also added extra mandatory objectives in each level, depending on the set difficulty. Thus, whether you're a FPS novice, veteran or sit somewhere in between, GoldenEye has a difficulty level that will suit you. This formula encourages players to improve their skills and gives them an incentive to run through the game multiple times, kicking things up a notch each playthrough. Indeed, you could go through GoldenEye's campaign three times and each playthrough would yield a sizeably different experience from the last. 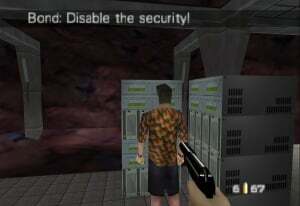 Rare continued to utilise this unique take on difficulty settings in its subsequent FPS titles, Perfect Dark and Perfect Dark Zero, but the system went unused until the Wii revamp of GoldenEye 007 in 2010. While this is indeed a shame, GoldenEye nonetheless clings onto other, less favourable old-school gameplay mechanics. Holding the shoulder button for more precise aiming at the cost of having zero manoeuvrability — while an innovative addition that pre-dates "iron sights" aiming — feels slightly too archaic now. It could be argued that GoldenEye is a shooter that's supposed to be played at a more methodical pace than today's run-and-gun titles anyway, with many missions requiring the player to remain completely undetected. But doing so is a lot more laborious than it should be with this stop/start aiming system feeling somewhat counter-intuitive. Of course, for many the above few paragraphs will consist almost entirely of moot points, because — as mentioned above — GoldenEye is most fondly remembered for its immensely enjoyable multiplayer suite. Those iffy visuals and the less-than-convenient aiming all fall by the wayside once you get three friends to join in the fun. 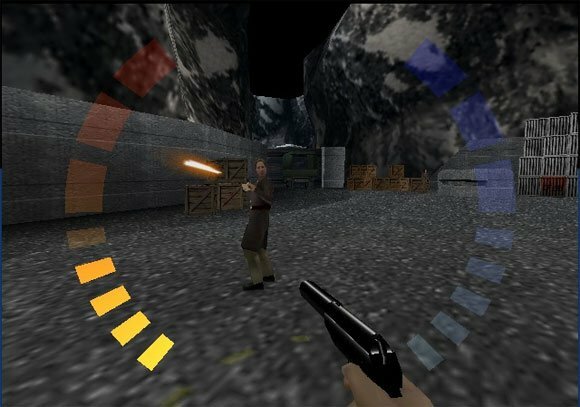 GoldenEye multiplayer doesn't quite boast the dizzying array of options of its spiritual successors, but its five distinct modes and their team-based variations each bring with them a unique gameplay mechanic to keep things fresh for a long time. Normal is your standard deathmatch, while You Only Live Twice and Licence to Kill shakes things up slightly; the former sees players only possessing two lives before they're out of the game, while in the latter mode a single shot from any weapon is enough to kill you. Additionally, The Living Daylights has players all scrambling to hold a flag for the longest time in order to win, but it's The Man With The Golden Gun that's by far the most interesting and frantic mode in the game. Only one Golden Gun — a weapon that kills with one shot — is available in a match, and once a player grabs it the only way for his/her opponents to gain possession of the fabled firearm is to kill them for it. This leads to some frenetic action in which fragile alliances might be forged in order to take down the holder of the Golden Gun, at which point all cooperation is thrown out the window as a three-way struggle for the gun ensues. 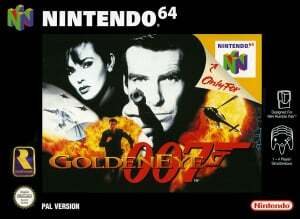 When paired with a generous helping of arenas, a plethora of available weapons and an insane roster of characters from the Bond universe — spanning 35 years of Bond's history — GoldenEye's inspired variations on the standard idea of four people all trying to shoot each other in the face go a long way to keeping its multiplayer modes tremendously entertaining even now. Let's be honest: GoldenEye 007's visuals have dated terribly, and the precision aiming mechanic is fiddly and ever so slightly impractical, but this is still inarguably a textbook example of how to put together a FPS that's built to last. It's also one that represents one of the very last instances of genuine innovation in a single-player FPS: going through the campaign presents players with pseudo open-world levels and objectives that alter depending on difficulty, two things that developers have for some reason discarded in favour of linear level design in which the only goal is to shoot everyone or maybe stop to press "X" and trigger a context sensitive event. GoldenEye definitely has certain aspects that haven't aged well, but as a history lesson in how things used to be done and as a split-screen multiplayer game, GoldenEye still delivers the goods where it counts. I'm not a fan of shooters, but I'm glad to see that this is still a good game. It's hard too imagine just how much the genre's changed over the years! 0_0 It just got reviewed now? I thought there was a review for a while. Great review, not letting Nostalgia getting in the way. And even then it's still a good game! I'm going to get this and some controllers and throw a Goldeneye party! I'm currently on a retro reviews frenzy. This was missing and I got in there as soon as I noticed its absence. I like License to Kill mode the best. Good times. When compared to games of today, yes of course the graphics are inferior, and FPS controls have been streamlined. But when considered in the context of the time it was actually released (and this isn't a remake or re-release being reviewed here) I wouldn't give it a score below 9/10. How well do the graphics utilise the actual N64 hardware? Well we'd see better later on, but for a relatively early effort it was very ambitious and impressive. How well does it utilise the actual N64 controller. I never had any complaints at the time, and there was always the aim-assist option for when things got too hectic to stop and pick your shot. I preferred the controls to Turok anyway. As the review says though, what really holds up today and even puts the blockbusting FPS' to shame is the mission design, the range of weapons and things to do, and attention to little details (like shooting lights! Too many games don't bother anymore). I don't think you can review Goldeneye objectively in 2011. When it was released it was probably the best FPS ever made, certainly the best on a games console and in many ways revolutionised the genre. Nowadays it feels very dated but the impact it had in 1997 shouldn't be underestimated. A true classic. What Chozo85 said. It had a major impact on the gaming community and games to come when it released, but judging it by today's standards, especially given how expensive it is to buy the cartridge nowadays, it's really isn't worth it. there are plenty of better first person shooters available today for only a fraction of the cost. I never really liked it. I much preferred Duke Nukem on the Saturn and Doom and Quake on the PC. Goldeneye is the perfect FPS and set the bar for every FPS to come. The attention to detail, the graphics (for the time), level design and multi-player make this game a true masterpiece. It is an insult to give Goldeneye anything lower than a 9/10. This game goes for around $8 CIB on average. Played through this one again in Fall 2009 and was just as good as always! What I like about this website is that you acknowledge that a game has aged, and actually dig down deep into the game and not go with the popular score. Good review, it definitely deserves that 8. I never really 'got' the Goldeneye thing. I was used to FPS on the PC, and this didn't control as well or look as good. However, the ease of getting a multiplayer match going compared to PCs at the time can't be overlooked, and that was, admittedly, a blast! ..less than a 10 is madness. Lowering the score because of dated graphics now (when they were great at its time of release) is just plain unnecessary. Also, unless you were playing with a controller other than the 64's, i don't get the fiddly/impractical issue you have.. The method for aiming was fine, it also encouraged stealth to a degree (you could sidestep/crouch while doing it for example). This review's slightly blasphemous. Everything about the game was great actually. True, and also in the multiplayer. One of the reasons I enjoyed this game's multiplayer yet still hate that of nearly every modern FPS is that it was slowed down a bit, particularly with the shoulder-button aim. I prefer that; now when I play an FPS against friends, it's just reduced to two incredibly boring things: (1) speeding around corners in dual-analog to see who is slightly faster at moving the cursor, and (2) a contest to be the bigger nerd who knows more about the weapons, locations, etc than the other players. 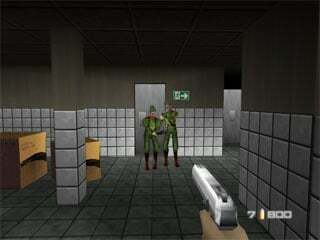 Goldeneye was far more balanced, so that a newcomer could still figure out the mechanics and compete. Golden gun is my favorite mode. i had never played through this game before until just recently. it is awsome. its probably some of the best graphics for N64. some place was selling this game for a cheap so i had to pick it up. i think it deserves 10/10. This can be applied to nearly every genre of competitive multiplayer games. Take Mario Kart Wii: I know every short cut and how to use every weapon appropriately to gain the upper advantage nearly anytime throughout the race. Noobiez parish = I win. Same can be applied to Madden (Sports), Super Smash Bros. (Fighting), and Tenchu (Stealth genre). If you put more thought into it I'm sure you could come up with more. Yes and no; it's an element of every game, but there are vast differences in its importance. Mario Kart's balancing is a good example; I hear fans complaining about the items in the recent games, but that's what makes it an enjoyable experience, where there's enough chaos to ensure that every single player has a chance to win at every point. You can know the shortcuts but they won't save you unless you keep alert and deal with the constant chaos of items, events, and other shifts. I've seen novices win against experts many times, and it wasn't just luck, it was a matter of playing with more focus, because MK is a game that punishes any pro who slacks off or flies on autopilot for even a moment. With Madden, you're right, and I hate the Madden series. I keep hoping that someone will completely rethink the football gaming genre, because it's dead to me as is. I'm thinking about purchasing the Wii version of Goldeneye 007 (the remake/reimaging) Can anyone tell me if its just as fun to play as the original? I'm not the best at CoD but I can take on experts when I'm in the zone. Which is relevant to what you said about Mario Kart. But when your great at a game and a noobie comes out of nowhere YOU are going to win. No matter what game it is even if it is GoldenEye. It's just how it is. And as for Madden well... yeah I very much dislike the game. There's nothing really fun about it. Watching it is funner than playing the game yourself. And lets say someone got a new Wii or PS3: That would be the LAST game franchise I'd ever recommend to them. It's very enjoyable. Although I personally prefer you use the Wiimote/Zapper. The Classic Controller Pro is HORRIBLE for GoldenEye Wii, ESPECIALLY on multiplayer. Dunno why, it just is. Nice review but it has a few factual errors. The controls you mentioned only pertained to the default settlings, and you could still strafe with the c buttons while using manual aim. There was also a Turok control setup, and not to mention dual analog. Dual analog required you to plug in two N64 controllers to play, and it ironically feels like holding a Wii Remote and Nunchuk. I'm glad you mentioned GoldenEye's level designs because they have still yet to be beaten. Perfect Dark was a damn fine game but still not as good as this bad boy. The reason I hate almost any and all modern FPS is because they have become simple linear drivel. 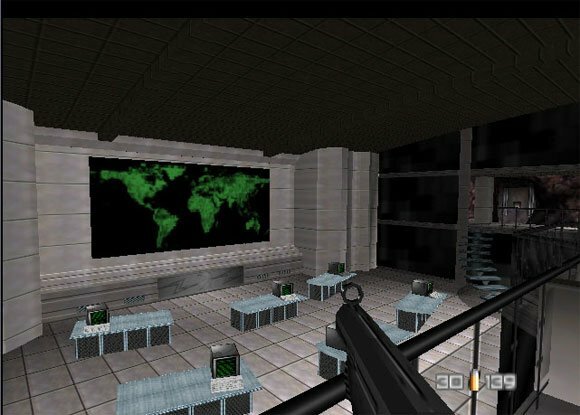 What happened to GoldenEye's open level structure? There are so many elements that modern FPS have yet to catch up on. Headshot are one thing, but variable body damage and animations for each hit are still only second to Perfect Dark. @29 warioswoods: Mario Kart Wii suffers from the most horrible game imbalancing. The older games were designed so that even a noob could win but more skilled players would rake up more wins over time. The Wii just a matter of luck and getting raped by items. @30 nintygaming: No. Nothing is as fun to play as the original. It's impossible to understate how groundbreaking and important this game was. I don't wish to knock Eurocom's game because they did a damn fine job, but other than better graphics and controls it still doesn't quite measure up to Rare's game. GoldenEye for the Wii is still a fantastic game and since it sells for as low as $20 new you have little to lose by picking it up. Pretty good game. The multiplayer really never seemed all that impressive to me, but that's probably because I got into games like Conker before this one. The singleplayer still holds up really well though. I borrowed the Wii-make from my library, and I did have fun with the campaign despite some issues [you can't completely customize the controls; the deadzone can't be made completely dead (meaning absolutely no camera movement while inside); you can't shoot while the Wiimote points offscreen (which is usually what happens when I turn more than just a little bit); you have to aim down the sights to get any kind of decent accuracy; and there's too much of a focus on pokey stealth], but I couldn't get into the multiplayer after so much time playing Conduit 2, especially since the health is so low that pretty much whoever notices someone first is extremely likely to get the kill. I don't agree; it's not just luck on the Wii game, it's a matter of chaos-management: those who can deal with the constant changing, attacking, exploding chaos around them will rack up more wins over time. That's far more fun than simply basing it on driving or drifting skill alone. It requires an incredibly alert and cautious mind, constantly looking out for the next attack to screw you over and finding ways to avoid trouble but stay ahead. I don't see it as all that different from Double Dash, which is in fact my favorite in the series. MKWii is More chaotic than DD, sure, but not a radical departure. Their probably isnt a number high enough to tally how many hours I put into this game both single player mode and multiplayer mode. So many good time spent on this games particularly multiplayer mode. I cant even remember how many times my friends and I would get together and end up in front of a TV lobbing grenades or zapping each other with the moonraker laser. Great Review makes me want to track down a copy of this game and play it on my N64. So even in single player mode (I only play by myself) the original is better? That's hard to say; it depends on your experience with gaming and how you would approach it. For its time, Goldeneye's single-player was amazing, and many of us are old enough (or even older...) to remember how big a step forward it was for console gaming. We can see it in light of its era and accomplishments, but that's hard to do now if you weren't playing back then. So, if you're not accustomed to those old games and the rules of the N64 era, you'd do better probably to pick up and enjoy the remake. It's an excellent game that offers a very cinematic single-player experience I'm sure you'll enjoy. I'd recommend buying it if you have any interest; I doubt you'd be disappointed. @32 - That's not a factual error. If you use the precision aiming - pressing the shoulder button - you cannot walk around. You can peak around corners and crouch, but not walk. I use the Turok style controls - on every N64 FPS, not just GoldenEye - and the precision aiming is included. I remember when this game was announced my friend was so excited about it. Even though I was a huge Rare fan, I wasn't particularly interested in Bond or FPSs, so I pretty much ignored it. Then gradually it seemed like every one in school was talking about, playing it, selling their PS1s to get N64s just for it. I couldn't really ignore it any longer. I went out to get it, but it was sold out everywhere, so I had to wait, but when it finally arrived I was totally blown away by it. Definately a classic. One thing I think a lot of people seem to forget about GoldenEye, or maybe they never realized it in the first place, is that it has a dual analogue control option that makes it play pretty much like any current gen dual analogue game (using two N64 controllers that you hold by the center prongs). In some ways it actually feels better than current dual analogue controllers because both your hands can move freely and it actually feels like you are dual wielding two guns the way you hold the controllers. Now that was something way ahead of it's time. GoldenEye was a masterpiece, was genre defining and is a true classic that deserves any praise it gets. A classic. It's a bit rough to go back to these days but it was something special when it was released. I'd say the score is adequate, but even today, the multi-player can't compete, as far as I'm concerned. Perfect Dark is PERFECTION as far as multi-player goes, in my humble opinion, and what is not said here is that if you're isolated from friends, Goldeneye only has solo mode, which is not helping it against PD. The absence of bots in multiplayer is the thing that I miss most in this game. Is it really worth judging these old games by todays standards? I think they deserve better than that, score it based on what the hardware was capable of at least. @46 - Then an 8 is fair. Todays shooters are hopelessly degenerated compared to GoldenEye's and Perfect Dark's ultrarealism. Graphics and controls got much better over time and we have online now and so many GigaBytes to use, but there hasn't been a fps in 14 years that was as groundbreaking as that little 12MB GoldenEye catridge. It doesn't really matter what the score is, read the review. I've gone back and played it on my original N64 and I believe it hasn't held up well at all. It's horribly dated, albeit an almost perfect mission system that should still be applied in shooters today. @37 nintygaming: If you can get past the controls/graphics yes. @38 warioswoods: There is no way to manage the chaos in MK Wii. The simple fact that you lose an item every time you get hit dooms you to failure. The inclusion of 12 racers verses 8 means more items to get owned by. Not to mention the over abundance of uberpowerful items like lightning, stars, bullet bill, super mushrooms, and that even more annoying than ever flying blue spiney guarantees that the games come down to luck. @el-marko no matter how hard you try you cant take away peoples enjoyment of this game. @48 Who cares if they're not groundbreaking? If the games are overall improved, no matter how little, then they're still better games, period. It's the same reason I don't approve of scoring a just-as-good or improved sequel on the same system worst than the original game just because it was a "lazy sequel" or "not innovative enough." Besides, as the video game industry (or even individual video game franchises) gets older, it gets harder and harder to innovate simply because there are fewer possibilities that haven't already been done. 8?? Really?? "It is an insult to give Goldeneye anything lower than a 9/10"
@daznsaz - I'm not trying to "take away peoples' enjoyment". I looked at the game objectively: at how fun it is today, how well its aged, its options, its quirks, etc, and gave it the score I felt it deserved. If you don't agree, that's fine, but if you look at the scoring policy page, you'll see that an 8 equates to "very good" and that "minor niggling factors" make it fall short of a 9. If you read the words above these comments, you'll see that I made reference to those "minor niggling factors" and scored the game accordingly. Again, you're entitled to your opinion, but I've basically said that GoldenEye is very good. You can't say fairer than that, can you? no thats fair enough.its down to each individuals experience anyway.i can see clearer now ive had a nicotine lozenge lol. Whilst Goldeneye wouldn't score highly in the graphics department, it is still one of the most enjoyable games I've played to date. I know of no movie-based game that delivers such awesome gameplay and it's charm is just fantastic. Whilst I may be lynched for this, I do think it is a shame that Activision, Rare/Microsoft and Nintendo didn't sort out some sort of deal for Xbox Live, and it is a shame that the remake on the Wii is a fairly average shooter, I would gladly pay full price for this game to be re-released on the Nintendo virtual console. This is still my fave N64 game!!! I played this for hours!!!!!!!!!!!!!!!! so much so i used to dream i was in the game! you no you,ve played it to death when u start dreamin your james bond!!!! lol! Sorry but I don't see the point in reviewing a game from 1997 and then applying today's graphical standards to it. A 10/10 through and through. A few months ago there was an n64 console on sale with Goldeneye and MarioKart at my local pawnshop. No matter that every additional controller was €15, no matter the fact that my girlfriend threatened to leave me if I played it while she was in the house and certainly no matter buying the extra adaptor thingy needed to plug it in to a hi-tech television. I don't have another console and I couldn't care less about buying one. When I was younger I played on all sorts of consoles, today I'm not really the gaming type. Actually if I'm going to be honest I bought the television because I found the console, I've never owned one before this. I wouldn't do the same for Crash Bandicoot, Ace Combat or Tomb Raider. Not only is Goldeneye part of my youth but it's just a damned good game that'll infuriate me until I pass every single level on every difficulty level and get every single cheat. easily a 10, a game way ahead of its time. and one of the first titles to fully exploit the rumble pack - you'd get a different rumble effect depending on the type of gun - mindblowingly cool. dislaimer - many a teenage hour 'wasted' here, unlocking all the cheats and going in on multiplayer. bunker with remote mines!!! The soundtrack in this game is just plane AWFUL! but the controls, and the fun is just worth playing! I'd give it a 7 or 8. Got back into gaming on my old N64 recently and while I must admit the graphics aren't really comparable to what is seen as standard today (but who would seriously do that anyway) this game defined my passion for gaming! I'm with all the 10/10 people. This game pretty much made 4 controller ports the standard for all future consoles. Not only was it the best FPS at the time but it was also the best ever officially licensed movie game and one of the only decent ones that wasn't based on a disney cartoon. I hope the wii u's extra screen gives us the kind of multiplayer joy that the N64's quad controller ports did back then. This game and ocarina of time were the reasons i wanted an N64 in the first place. Goldeneye was awesome to play alone and the funnest multiplayer game ever. Very fond memories. Only 8? I counted at least 10. This game gets a 10/10 in my book. The soundtrack was amazing considering the games cartridge size was a tiny 12 MB. The subtle shooting an enemies hat off or having a head shot be different than a body or limb shot. The humor of shooting a desk, chair, computer, or safe and having it explode was brilliant. This was created when RARE studios was at it's prime before they were acquired by Microsoft. For a game to get such wide praise from the gaming community at large even after nearly 16 years is pretty incredible.